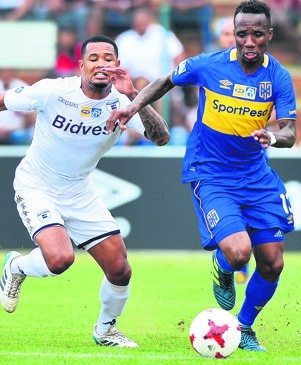 THEIR bad start to the season continues for Bidvest Wits – they have been booted from the MTN8 cup competition following a 3-1 aggregate semifinal defeat to Cape Town City. It is, however, the manner in which the defending champions lost 2-1 to CT City yesterday that should be of great concern to coach Gavin Hunt. Wits were unable to score in either of the two legs, as Robyn Johannes was credited with the opening goal – an own goal from the City captain. Amr Gamal then also scored at the wrong end as he connected with Ayanda Patosi’s cross to head in the equaliser for the Cape side. It was all over when Lehlohonolo Majoro rammed in the winner on the day on 71 minutes, feeding off Lyle Lakay’s cross to edge City into the final. Wits have hardly looked the team that swept to a cup double last season. So far it’s been a battle to reproduce their astonishing form as they still search for their first win of the season. The poor form could be put down to the recent international break, as Hunt’s training sessions missed no fewer than six internationals who had to honours national call-ups. But there is more to the Students’ poor start than the rhetoric of “we’re playing very well, we just can’t score” by Hunt. Montenegro defender Slavko Damjanovic looked lost in the heart of defence, Steven Pienaar couldn’t fully stamp his authority in midfield, while striker Gamal found himself in the wrong place, scoring for the wrong team. The Citizens had a narrow 1-0 lead from the first leg but Wits found it hard to scale the peak. Thulani Hlatshwayo thought he had scrambled in the opener early on but the goal appears to have been an own goal by Johannes. It was a welcome goal, nonetheless, as it gave Wits an early breakthrough. In fact, apart from the Gamal own goal, City created nothing of consequence, lacking cohesion in attack. It was an opening half highlighted by Victor Gomes’ poor officiating, with no fewer than two questionable decisions. Frustration reigned for Wits, a discontent Pienaar seemingly falling just short of getting himself booked for his outspokenness. As hard as they tried, the Students couldn’t get back into it and ultimately found themselves out of Wafa Wafa.